Some photos of the highlights of my 2009! My first book was published! Daughter graduated from high school. I've come down with something nasty and will not be able to finish. Maybe next year? Happy New Year, everyone. I'll post again after the plague has passed. I pieced this shop sample in my hotel room at the Vermont Quilt Festival last summer. It's been hanging, unbound, in my local quilt shop ever since. Again, I pulled it off the wall to finish the binding so I'd have a chance at reaching my fifty finishes. I have no shame whatsoever. I needed a quick gift a while back, so I quilted up a sheet of potholders. I cut them, sewed the binding to the front, finished two potholders and let the rest sit for many moons. Since it's gift-giving season and I needed some more quick gifts, I pulled the stack of unfinished potholders out and bound them. My husband is good friends with a young man at work and I'm friends with his young wife. (We find that very convenient.) We met them shortly after they married. I've always felt bad that I didn't give them a quilt for their wedding, so I'm giving them a quilt for Christmas. It won't be delivered until they come to our New Year's Eve party, so I was given a few days grace to finish it. I'm sorry for the dark photo -- we were chasing daylight. Does anyone have a copy of Thimberries Beginner's Luck book? I do, and I cannot count the number of quilts that I've made from it. All of this fabric was in my collection (stash is a dirty word). It was pieced quickly, quilted quickly, and bound by machine (gasp!). Last spring I went to Quilt Market in Pittsburgh with my friend who owns a quilt shop. She let me sit with her while she shopped for new fabrics. I ooh-ed and aah-ed over all the pretty colors, but my friend noticed extraordinary joy when I saw Birdie fabric from Moda and ordered the fabric for her shop! I pieced and quilt this around Thanksgiving, and it's hung on the shop wall, unbound ever since. Since nothing will deter me from finishing 50 quilts in 2009, I pulled it off the wall and bound it. That makes it officially finished, does it not? Once upon a time, I made enough blue and white blocks to make five baby quilts. Quilts 1-4 have been quilted, bound, and given away over the years; quilt 5 has lain unnoticed in my studio for several years. As I am striving to reach my goal of 50 quilts finished in 2009, I pulled this forlorn little quilt top out and finished it! My daughter's friend has an absolutely adorable neice. I made a quilt for her birthday last year. Fortunately it was child-sized, or my daughter's friend would have stolen it and let her neice be quilt-less. Since I finally finished my son's friends graduation quilts (after only 4 years), I'm working on my daughter's friend's quilts (only 6 months late). I reproduced the little girl's quilt in a person-sized manner. It even has a cool purple spider-web back! Eleven more projects to go this year. I'm still not sure if that's gonna happen, but I love the empty spaces in the sewing room as the projects head out the door! Five years ago, a lovely girl graduated from high school. At that time, I made her a quilt. About 5 minutes later, her mother stole that quilt from her. This lovely young lady is now in her own apartment, quiltless. My 38th finish of the year should rectify that situation. I make this scrappy four-patch quilt whenever the 2-inch square bucket overflows. It even has a scrappy back! After it's lived it's life as a sample, my daughter has laid claim to it. "I don't want to keep it, Mom, I just kind of like it." Alrighty, then. .... you're probably pronouncing it wrong. This summer, my son got married (yay!). At the wedding, my husband's uncle asked if I could make a Kokopelli quilt for his wife. I promised to get right on that, after the mother-son dance and other trivialites. In early November, I had a "holy crap!" moment, when I remembered that I had promised this quilt by Christmas. I found paper-pieced patterns and embroidery patterns for Kokopelli and they all screamed one thing to me "we'll take FOREVER to make!" Off to the internet I went to find Kokopelli quilt fabric. Once the fabric arrived, I quickly chopped it into large pieces thanks to "Beginner's Luck" by Thimbleberries. I finished the binding and mailed the quilt before Christmas. I deserve chocolate. Lots and lots of chocolate. There is some fun quilting in the black that can barely be seen. It has long rows of feathers, made with Handi Quilter Groovy Boards. This will be a gift for a special young lady (who I hope doesn't read my blog!). 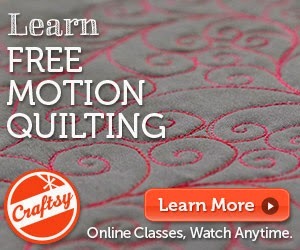 Fifteen quilts in 10 days.... can she do it? Probably not! I'm not dead. I've been silent due to travel, both work and personal. I'm not sure if I'll be able to publish Fifty Finishes by the end of the year. I've finished over fifty projects, but many are secret to-be-published projects that I cannot share here. Last night I made the cutest. apron. ever. ... a hammer good internet connection, I could upload photos and write an interesting blog post. This will have to do until I get back home from back to back to back to back quilt shows and hotels with sub-standard internet service. After our piggies went to the beach, my friend and I went to Maine Quilts. Winter sure does come early up here. The only coat I brought with me was my Steeler hoodie, a less-than-popular garment up here in Patriots country. It was so cold that I risked life and limb just to stay warm. When I saw these signs, I thought they were left over from the winter months, you know, like January. Apparently they are appropriate for July, too. ...went to the beach! My friend and I went for pre-wedding pedicures last week. I don't think our toes showed much at the wedding, so we needed to take the piggies on a road trip. Both of my feet actually came with me to North Hampton, NH, but the other one is out of photo range, balancing me to make sure I didn't fall down into the water and all of that. I do have some class, after all. Yeah, she's my friend. You can't have her. I strip-pieced and hand-quilted this quilt when my son was in grade school. The basketballs (and batting) have gone flat. The chain (and quilting threads) have been broken. This quilt went everywhere with my son. It's been to Mexico a few times and even to the Ukraine. We visited the quilt at college for Thanksgiving my son's freshman year and realized the quilt had outlived it's usefulness. The binding was in tatters and the quilt was a worn, thin, dingy mess. I rushed home to make him a replacement quilt for Christmas. This quilt was completed in three weeks and is not fancy, but took my son through the next 3-1/2 years of school. It's going in my his linen closet now. Check out the other one two three. These quilts were finally given to their owners last night. At my son's wedding. More on that later. At thirty-one quilts finished for the year, I'm on track for Fifty Finishes. How are you doing? 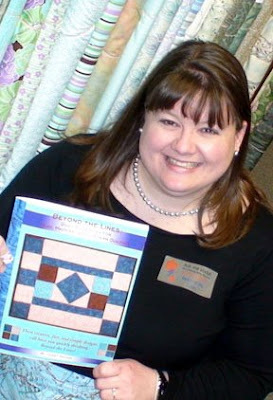 A new quilt blogger blogged me. Check her out. I'm having fun finishing my quilts, and my sewing room is getting a wee bit cleaner in the process. Is anyone else making progress on their UFOs? .... went with a friend for a pre-wedding pedicure. After weeks of work, work, work, work, work, it was good to take an hour and get some pampering. This finish is a small one. 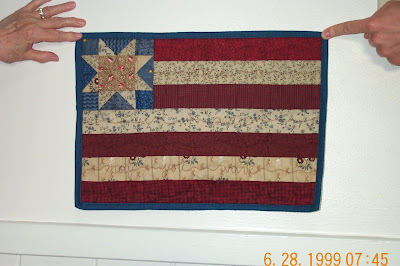 I pieced it at my quilt retreat in January but quilted it last week, just in time to give away. I actually wrapped it before taking a photo (the horror!). The quilting in the light stripes says: "forever .... in peace.... may you wave"
The hostess' home is decorated in Americana and I knew it would look perfect. I also knew that my husband's aunt (a quilter) would understand my panic call to my husband begging him to take a photo. Those would be Aunt Marilyn's rings in the photo. Did anything special happen early last fall? I'm trying to figure out why I'm being called upon to make an unusually large number of baby quilts this season. My daughter and I are an interesting mix. We look exactly alike. We have many things in common. Like many daughters who are so burdened, my daughter tries to be different from me in as many ways as she can. One noticeable difference between us is.... she's not a quilter. She's not even a fan of quilts. Gasp! But I love her anyway. I show her every quilt I make and ask if she likes it. I always get a variation of "it only matters if you like it." Imagine my surprise when I asked her if she liked a recent quilt and she replied, "Yes." She even explained why she liked it. I was bowled over with shock. And then I gave her the quilt. Don't tell my mom, though. She thinks all tablerunners should be hers. I surprised all the guests at my daughter-in-law's bridal shower by NOT making her a quilt for the event. Instead, I made placemats and napkins to match her dishes. Sorry, I caught as much sun as I could! Moving the house seemed a drastic step to get full-sun for a photo. In previous posts, I've described all the wonders that are Jennifer. She's pretty much the best hairdresser in the whole world and she's mine all mine. For about a dozen years, I've been looking for an excuse to make her a quilt. Finally, she opened a new salon and gave me the reason I've been looking for (for which I was looking?). The pattern is Bento Box and I love it! Isn't that a patient look on his face? I think he had been awake for about 3 minutes when I asked him to help with the quilt. Such a good boy! I know I've mentioned that he's looking for a job as a music teacher, but that is no longer the case. Students in grades K-2 in a local school district will benefit from his daily attention. Now he'll be able to support the bride he's taking in less than 2 weeks! It's the bridal party! I attended my future daughter-in-law's masquerade-themed bridal shower over the weekend. The bridal party. I think they might all wear matching dresses in the next group photo. Less than 2 weeks to go! 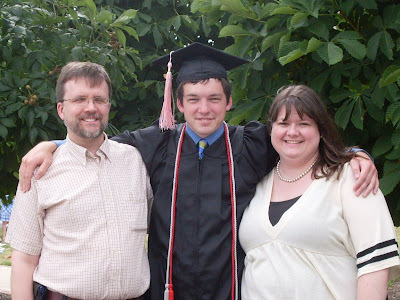 We've had our fill of dark and stormy nights lately, but this one was when my baby graduated from high school. Even with the soggy hair, soggy clothing, and the too-tight quarters, my daughter and 502 of her closest friends walked across the stage and graduated. My babies are all grown up now. Maybe I can retire now? I'm not a shopper. At all. Since my son is getting married in a few weeks, I've had to venture to the 10th circle of h*ll known as the shopping mall for shoes and other items for the festivities. I'm always on the lookout for some amusement, though, and the mall did not fail me. At least my day at the mall wasn't a complete waste of time. The fabric was all scrap and the pattern was Splash from Fourth & Sixth Designs.